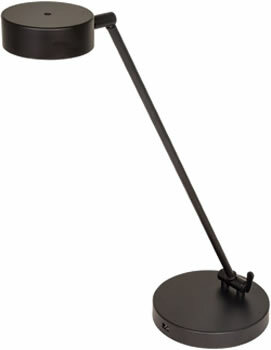 Dimensions: Height 16.5" x Width: 7.13"
Dimensions: 17.5" x 9" x 20.25"
For focused light in a modern silhouette, this task lamp delivers style and substance. 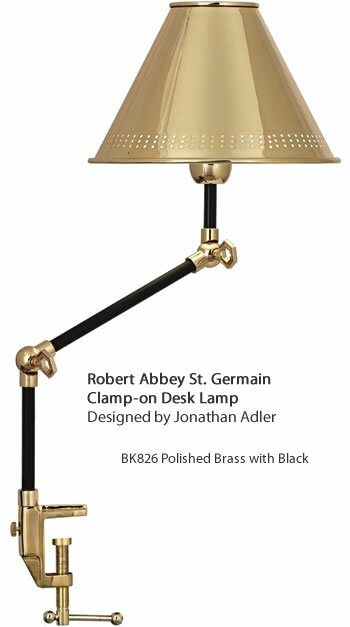 The black of the metal shade is carried through the silk-wrapped cord, while the brass neck makes a sleek style statement. 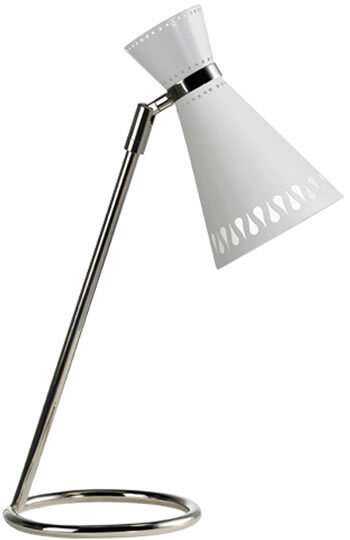 A white powder coated interior to the metal shade helps reflect light to enhance the 9W LED bulb within. 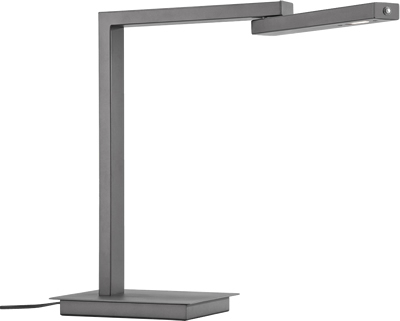 A copy of an award winning lamp, the Lite Source LS-306 Halotech Counterbalance Desk Lamps are available in LED or Halogen in Polished Steel, Matte Black or White finish. 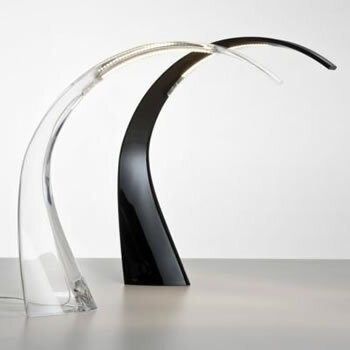 Dimensions: Width 1.9" x Height 22.8" x Depth 24"
Taj, more than a lamp, is a three-dimensional sign, a luminous sculpture, a presence as much at home on your desk as on another piece of furniture. 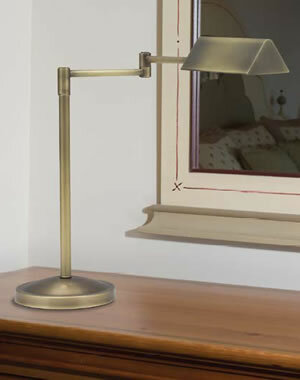 Although it is a table lamp, Taj abandons the articulated, jointed and mechanical stereotype for a simple form serving the practical function for which it is intended. 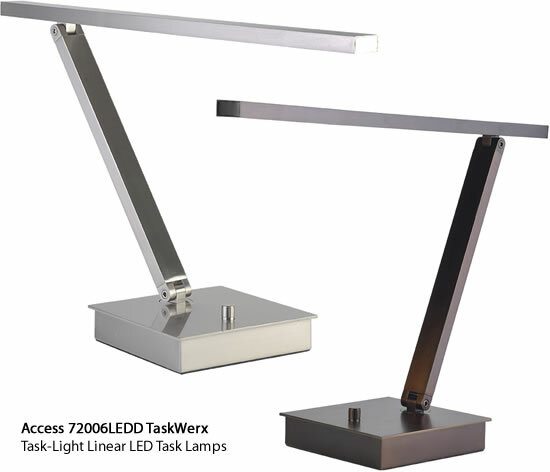 Beautiful both either on or off, Taj uses LED technology to optimize and minimize the light source as much as possible and at the same time it is a new step forward in meeting the corporate technical challenge by producing an object from unique know-how. Taj is produced in the completely "naked" transparent version, in the "frozen" satin-finished plastic version and in the white and black matte versions. 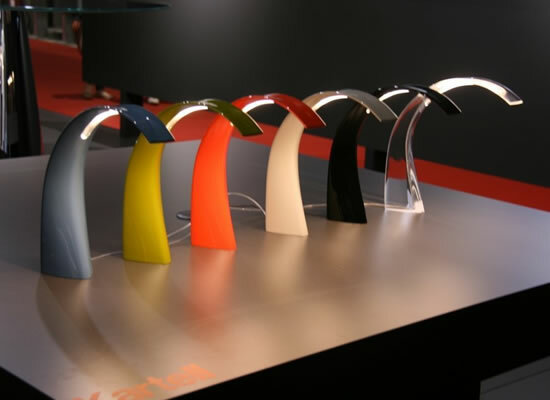 Dimensions: Width 3 3/4" x Height 13" x Depth 12 4/5"
Taj, more than a lamp, is a three-dimensional sign, a luminous sculpture, a presence as much at home on your desk as on another piece of furniture. 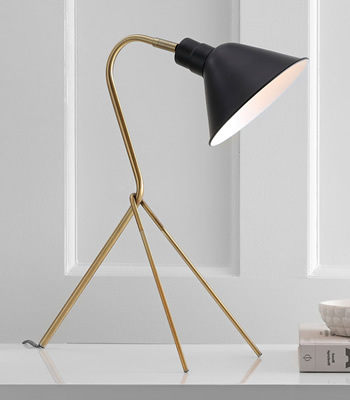 Although it is a table lamp, Taj abandons the articulated, jointed and mechanical stereotype for a simple form serving the practical function for which it is intended. Beautiful both either on or off, Taj uses LED technology to optimize and minimize the light source as much as possible and at the same time it is a new step forward in meeting the corporate technical challenge by producing an object from unique know-how. Taj is produced in the completely "naked" transparent version, in multiple matte versions. 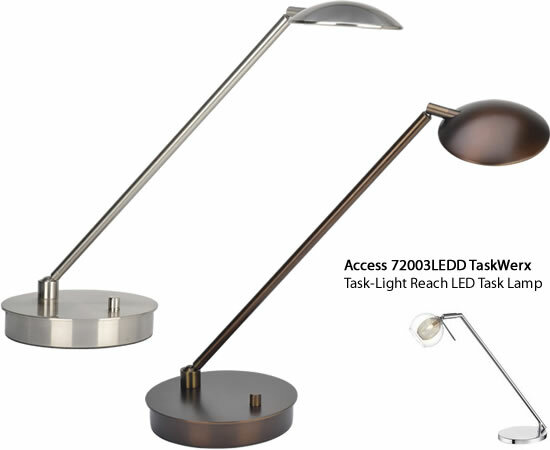 Cavendish LED Task Table Lamp. 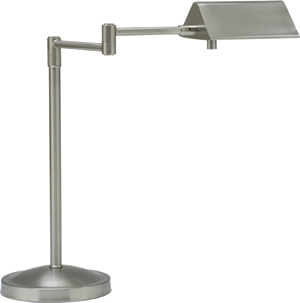 Height 21", adjustable shade, with touch dimming control. 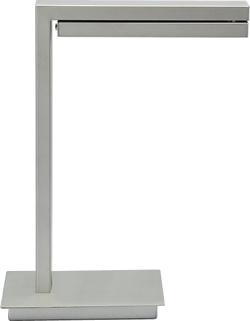 Width 15.5"" x Height 21""
Dimensions:L 26" W 7" H 14"
Dimensions:L 7" W 7" H 22"
Dimensions:L 16" W 7" H 19"
Halogen swing arm Table Lamp. 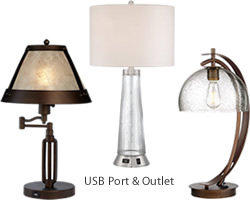 Full range dimmer on shade. 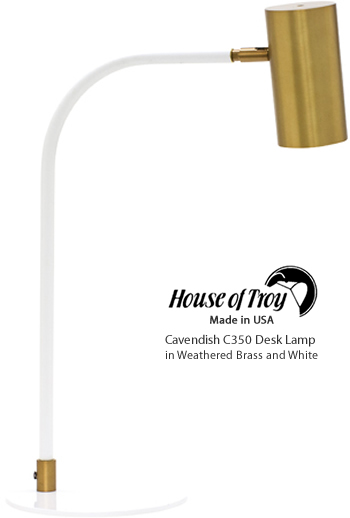 50W halogen bulb included. 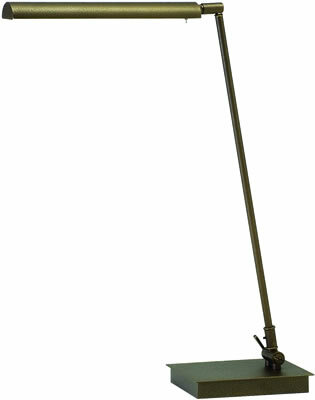 Coordinating single and double swing-arm floor lamps Lamp, single and double swing-arm wall lamps available. 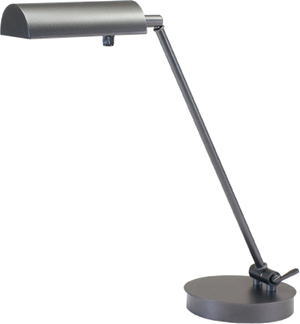 Adjustable LED table task lamp, full range touch dimmer on shade. USB port on base. Durable powdercoated finish. 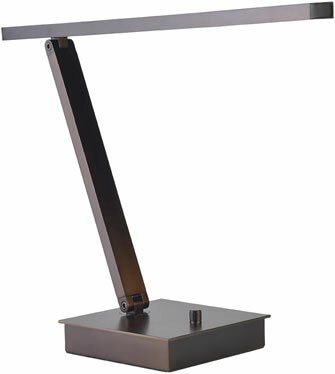 Adjustable LED desk or piano lamp. 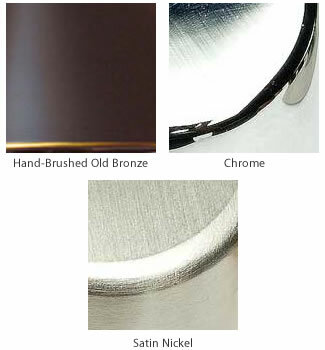 Durable powdercoated finish. 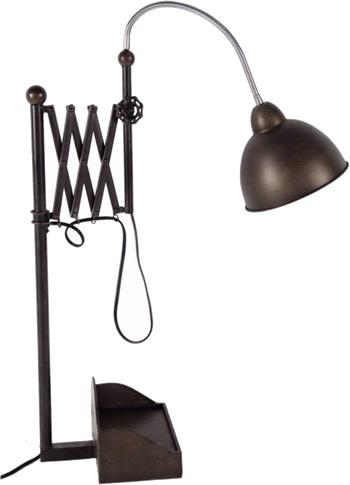 Coordinating Floor Lamp and Swing-arm wall lamp available. 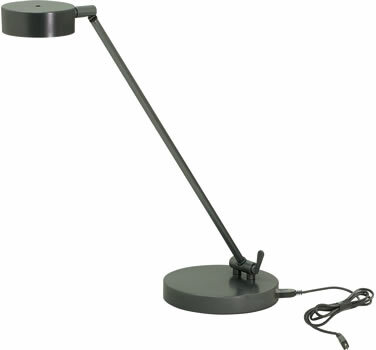 Adjustable Table Lamp. 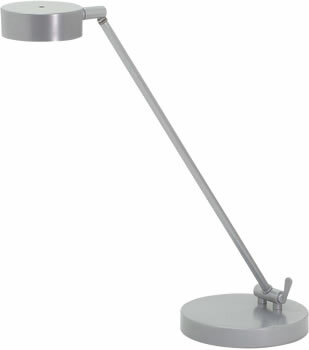 50W halogen with full range dimmer in shade. 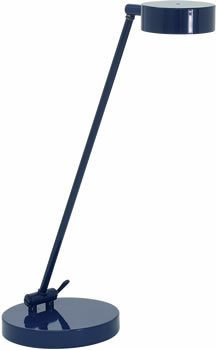 Durable powdercoated finish. 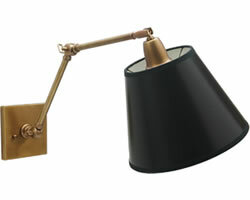 Coordinating Floor Lamp and Swing-arm wall lamp available. 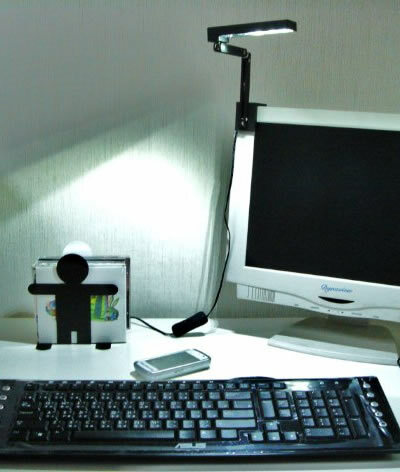 The BE Light is an LED desk lamp that folds and sports a unique articulated design. 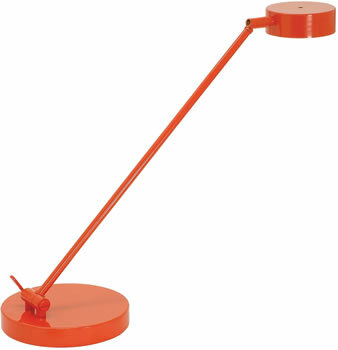 With its clever hinges, it can be fully extended to a height of 13 in and an angle of up to 135 degrees. 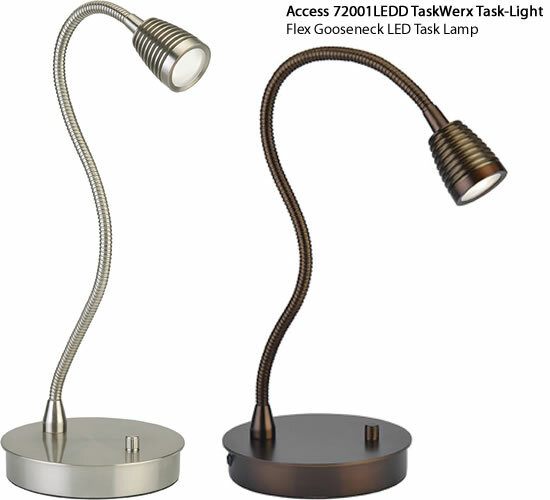 It also provides adequate task lighting with white LED . 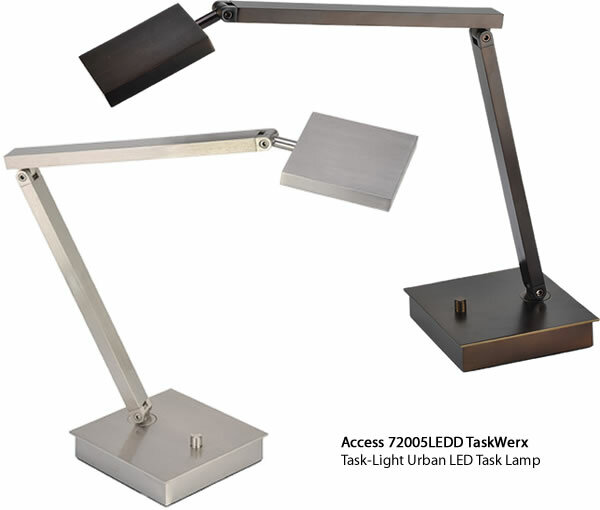 When not in use, it can be folded down to a minimum height of 0.75 in, taking up the least amount of space on a desk. 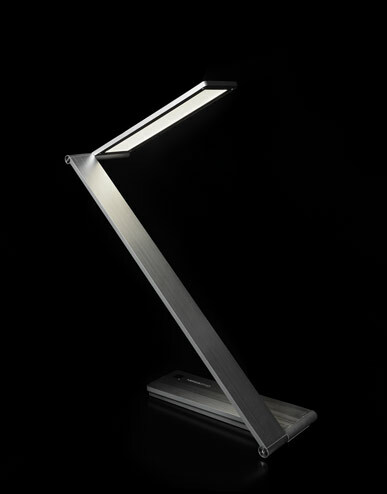 Once again, QisDesign, a leading lighting design brand, approves itself by winning the prestigious red dot design award 2012 with its BE Light. This year, 4,515 products from over 70 countries joined the competition. QisDesign faced up not only to the tough tournament but also to the critical eye of the jury winning the globally renowned award this year reaffirms QisDesign's excellence in design. 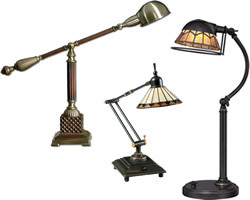 ffices and nightstands in bedrooms of luxury homes. 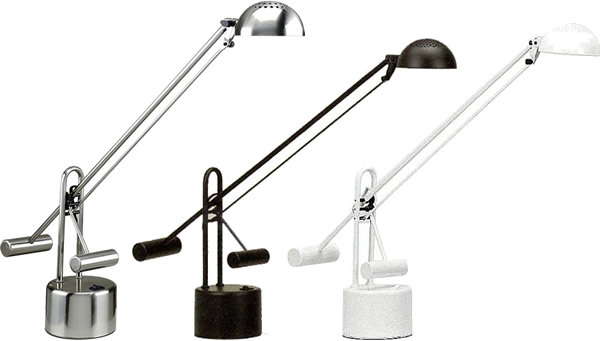 With an extensive life, the task luminaire will provide smooth arm operation for many years. 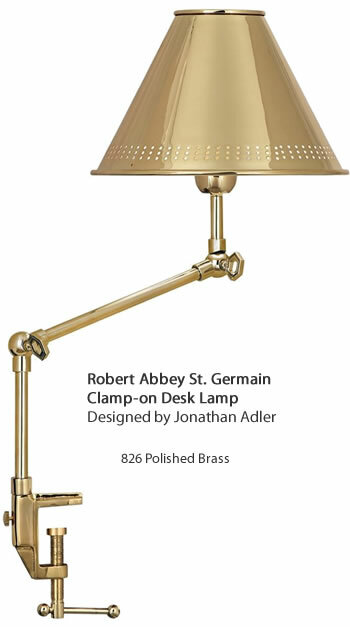 Easy fingertip touch dimming and an adjustable head directs light precisely where needed and at just the right level of light. 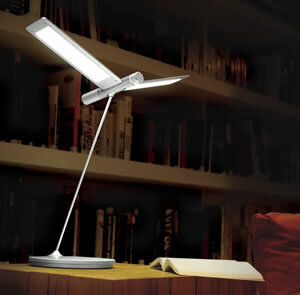 A clever LED swing arm reading light that folds-in completely to neatly and orderly fit within modern design elements. Integral memory touch dimmer conveniently located for fingertip control. 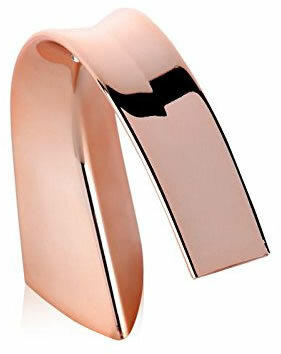 Winner of the Gold Pin Design Award 2011. 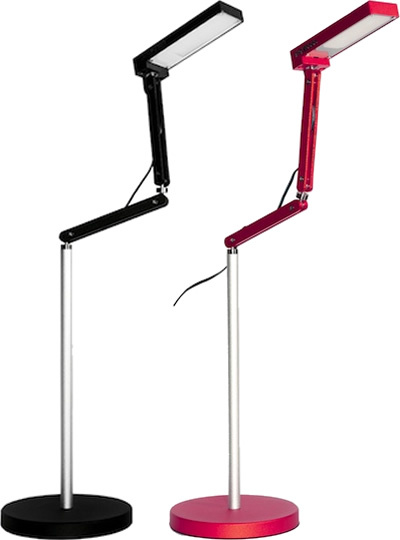 The Spanish word "Tocar" means "to touch or to feel" in Spanish and is an apt name for the playful Toca LED light fixture. 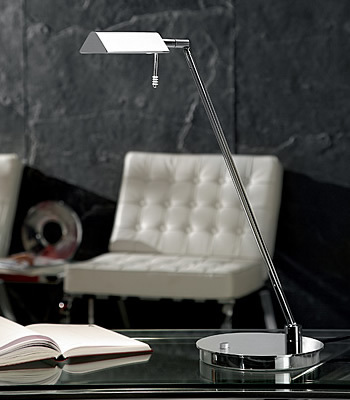 Made with aluminum alloy, the Toca LED is strong and versatile. 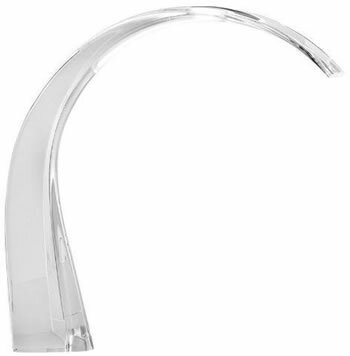 The light fixture's arm joints rotates in all directions freely and will stay in that desired position without the need of tightening adjustments. 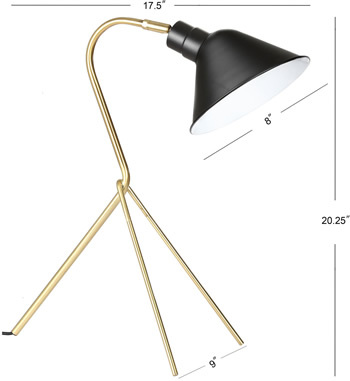 The Toca Bamboo LED comes in two versions: desk lamp and clamp-on lamp. 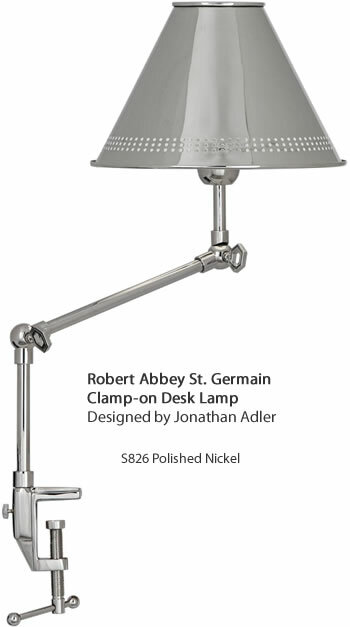 The clamp-on lamp makes it easy to clamp on any table surface. 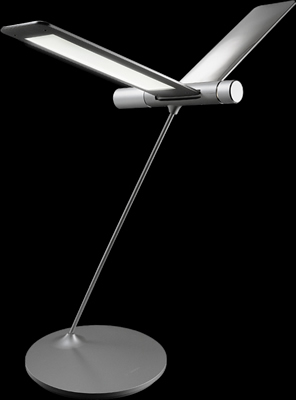 The Seagull Light, an LED Table Lamp, takes the form of a flying seagull and functions similarly too. 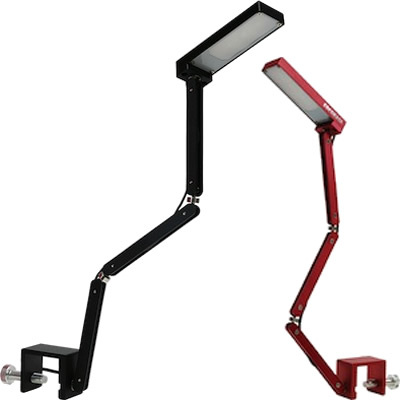 In response to the eco trend, the light adopts LED as lighting source which consumes much less energy than traditional lighting sources, yet provides the same brightness for both ambient light and reading functions. 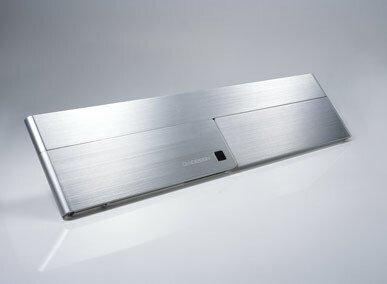 It has two knobs on the main body, the front one for adjusting brightness and the back for adjusting lighting angles. The "wings" change positions in accordance with the light adjustment, imitating a seagull flapping wings to soar into the sky. 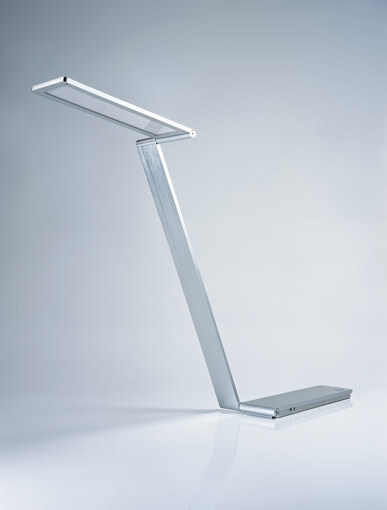 The design cleverly integrates aesthetic beauty with functions, delivering not only light but also interactive fun to users.